Part 1 Marine by-products characterisation, recovery and processing: Physical and chemical properties of protein by-products from seafood waste; Physical and chemical properties of lipid by-products; On-board handling of marine by-products to prevent microbial spoilage, enzymatic reactions and lipid oxidation; Recovery of by-products from seafood processing streams; Increasing processed flesh yield by recovery from marine by-products; Enzymatic methods for marine by-products recovery; Chemical processing methods for protein recovery from marine by-products and underutilized fish species. Part 2 Food uses of marine by-products: By-catch, underutilized species and underutilized fish parts as food ingredients; Mince from seafood processing by-product and surimi as food ingredients; Aquatic food protein hydrolysates; Functional properties of protein powders from underutilized marine fish and seafood products; Marine oils from seafood waste; Collagen and gelatine from marine by-products; Seafood flavour from processing by-products; Fish and bone as a calcium source; Chitin and Chitosan from marine by-products; Marine enzymes from seafood by-products; Antioxidants from marine by-products; Pigments from by-products of seafood processing. Part 3 Non-food uses of marine by-products: By-products from seafood processing for agriculture and animal feeds; Using marine by-products in pharmaceutical, medical and cosmetic products; Bio-diesel and bio-gas production from seafood processing by-products; Composting of seafood wastes. Despite declining stocks, a major portion of the harvest of fish and marine invertebrates is discarded or used for the production of low value fish meal and fish oil. Marine by-products, though, contain valuable protein and lipid fractions as well as vitamins, minerals and other bioactive compounds which are beneficial to human health. Devising strategies for the full utilization of the catch and processing of discards for production of novel products is therefore a matter of importance for both the fishing industry and food processors. Maximising the value of marine by-products provides a complete review of the characterisation, recovery, processing and applications of marine-by products. Part one summarises the physical and chemical properties of marine proteins and lipids and assesses methods for their extraction and recovery. Part two examines the various applications of by-products in the food industry, including health-promoting ingredients such as marine oils and calcium, as well as enzymes, antioxidants, flavourings and pigments. 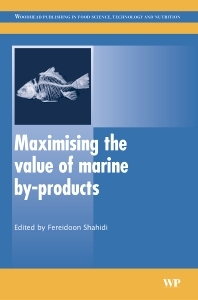 The final part of the book discusses the utilization of marine by-products in diverse areas such as agriculture, medicine and energy production. With its distinguished editor and international team of authors, Maximising the value of marine by-products is an invaluable reference for all those involved in the valorisation of seafood by-products. Professor Fereidoon Shahidi is a University Research Professor at the Memorial University of Newfoundland, Canada. He is highly respected for his research in such areas as marine products and functional foods.